The Atmospheric Imaging Assembly on the Solar Dynamics Observatory captures images of the sun's corona. This image shows the 1.5 million-degree solar atmosphere and is taken at the start of the Hi-C sounding rocket observations. Released Jan. 23, 2013. A small NASA space telescope has revealed surprising magnetic braids of super-hot matter in the sun's outer atmosphere, a find that may explain the star's mysteriously hot corona, researchers say. The discovery, made by NASA's High-Resolution Coronal Imager, or Hi-C, also may lead to better space weather forecasts, the scientists added. "With potential annual economic impacts of tens to hundreds of billions of dollars domestically during periods of high solar activity, accurate forecasts of the local space weather environment can possibly save billions for power systems, commercial aircraft and a number of other economic sectors," said study author Jonathan Cirtain, who led the Hi-C sun corona mission. NASA's High-resolution Coronal Imager (Hi-C) capture over 50 16-Megapixel images of the 1.5 million-degree solar corona. The large image is the full frame image and the smaller images along the top and sides are sub fields of the image. The upper left corner image is from the Atmospheric Imaging Assembly on the Solar Dynamics Observatory and the box in this image shows the Hi-C field of view. Released Jan. 23, 2013. The surface of the sun is unsurprisingly hot, up to 11,000 degrees Fahrenheit (6,125 degrees Celsius). Bizarrely, however, the corona — the outer atmosphere far above the sun's surface — is hotter by a thousandfold, even in the absence of solar flares. Scientists recently found that powerful magnetic waves rippling from below the sun's surface may heat the corona by 2.7 million degrees F (1.5 million degrees C). However, that alone would not account for the corona's ultra-hot temperatures. Now high-resolution images of the sun's corona support the idea of magnetic braids generating tremendous amounts of heat, possibly enough to explain the readings of up to 10.8 million degrees F (6 million degrees C). 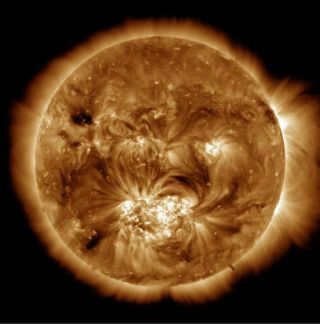 To picture these magnetic structures on the sun, "imagine a French braid in someone's hair," Cirtain told SPACE.com. "Bundles of individual hairs are wrapped about other bundles and together form a braided ensemble of hair. These magnetic fields are physically manifested within the super-hot plasma making up the sun. For instance, very highly curved magnetic fields can take the form of coronal loops, giant arches rising from the sun. "When a magnetic field becomes highly curved, it eventually becomes unstable," Cirtain said. Eventually these magnetic braids can grow unstable enough for individual magnetic field lines of force to interact within them. This phenomenon, known as reconnection, decreases the curvature of the magnetic field, releasing potentially vast amounts of energy that can heat plasma or accelerate solar flares and other massive outbursts. While astronomers have seen magnetic braids on the surface of the sun, until now they had little way to see how common the braids were in the corona. To glimpse the magnetic braids, the NASA team launched the Hi-C telescope on a sounding rocket in July. It captured images of the corona with a resolution about five times higher than previously achieved. The low-budget mission was filled with uncertainties. For instance, the mirror used in the telescope is so smooth that, across its 9.5-inch width, it deviates from perfect smoothness by only a few widths of an atom. There was every chance that mechanical stresses, temperatures changes and other factors before and during the mission could warp its surface, reducing its quality. "We would only know if it worked once we had flown and taken the images of the sun," Cirtain said. "This lack of control of the situation kept me up many nights." The telescope captured only five minutes of video data before re-entering Earth's atmosphere. Still, that was enough to discover magnetic braids in the corona, and the amount of activity seen suggested vast amounts of energy can be released there. The researchers, who detail their findings in the Jan. 24 issue of the journal Nature, conceded it is possible the braids they saw were not bundles of magnetic fields but sets of many nested magnetic loops overlying and underlying each other. If so, they would store less energy than estimated. Even so, however, the corona would still hold 100 times the energy needed to be super-heated. "My life for the better part of a decade went into this instrument, and seeing it work was exciting not only for me but for my family and for my close colleagues," Cirtain said. The researchers hope to launch their telescope in an orbital satellite to observe the corona longer.